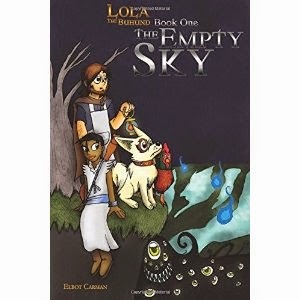 Elbot Carman's "Lola the Buhund - The Empty Sky" is the first book in a fantasy series about an intelligent, inquisitive Buhund and her exploits through a magical yet hostile land. Prithvi had its sky lose its stars a decade and a half ago, leaving the land all-but barren. The people who have survived are resilient, yet hoping the land returns to its former state. Venice , and his Buhund, Lola, lead a quiet life ... until they find themselves on an adventure that takes them through the magical land, meeting a variety of friends and foes. The casts of characters is eclectic, from the quirky, funny Grandmother to the evil Witch-Monarch, and the fantasy world is interesting. The writing is accessible for young readers (maybe nine and up, depending on reading level), yet isn't "dumbed down" so adult readers can enjoy it, too. The story has plenty of twists and turns to keep you interested, and the book ends with some closure yet makes you want to read book 2. I'd recommend this to anyone who wants a fun fantasy book set in a whimsical world.